Over the weekend, the last Theros legal tournament was held at SCG: Milwaukee. Because of this, many players are going to be looking at getting rid of extraTheros cards that they will no longer need moving forward. Rotation is upon us, so it is time to look at what the future might hold for Theros cards and which ones will be worth holding over the long term. Target number one, the best of the best from Theros block, is going to be Thoughtseize. I mean, take a look at this history just to get a picture of how in-demand this cards is even with tons of players looking to dump Theros in favor of Battle for Zendikar. Rotation hasn’t even made a dent in this card. One would argue that Goblin Rabblemaster is another powerful card from the current Standard, and look at what rotation is doing to it. Arguably one of the most powerful cards in Standard is getting kicked in the teeth because of rotation. What does this tell us about Thoughtseize moving forward, a card that we can expect to always see in Modern and Legacy? We’re not going to see much cheaper copies of Thoughtseize around, at least not until the next Modern Masters set is revealed. Players are holding this one, as we’ve been advising to them to do as #mtgfinanciers. 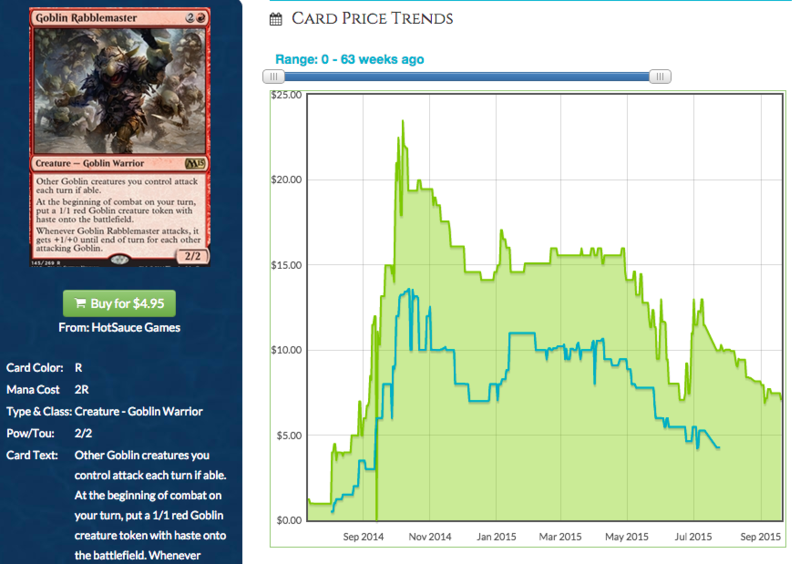 The low point for Thoughtseize was $15, so if you bought in then you’re looking pretty good now. The next best time to get out will be during the hype of the next Modern season. We all have a pretty sweet chance to get in on a foil lull for the card. All in all, Thoughtseize is looking pretty good as a spec moving forward, as we all know it will be. But what about other maybe non-obvious pickups? Let’s review some of the more talked about cards from the Theros block in reverse order, since Journey into Nyx was opened less and therefore we can predict that cards from this set will be more valuable in the future since fewer packs were cracked for drafting. Eidolon of the Great Revel is the number one card from this set that you should be targeting if you play any Modern or Legacy. Burn was put back on the map due to the power of EotGR, so picking up copies for future value gains is a good move since players are looking for playsets that want to play them. 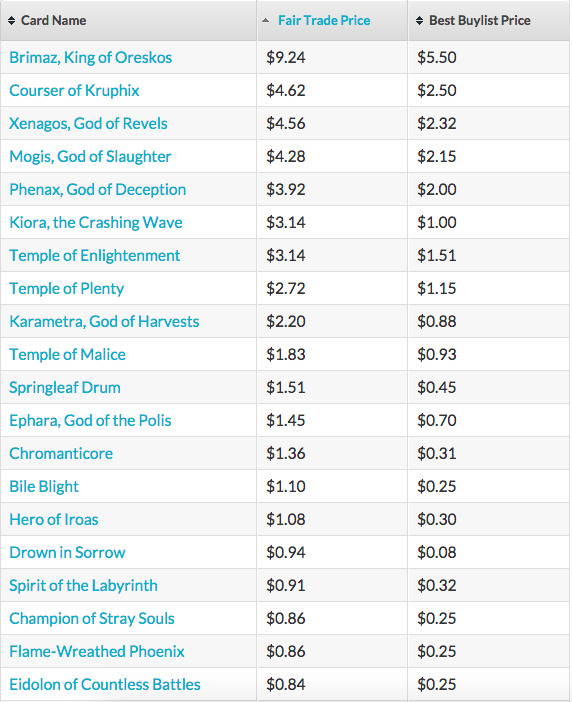 Keranos is looking to be the most valuable god from the sets, but I would pick up copies for Commander demand more than anything else. Yes, he does see play in Modern and sometimes Legacy, however I think his effect on these formats is marginal at best, and that most future demand for all the gods in general is going to come from the casual crowd. 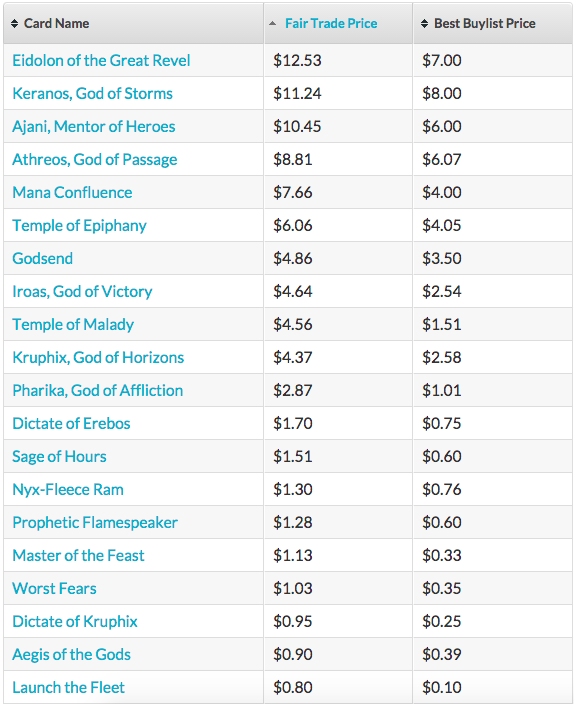 I would wait a bit to pick up all the gods, about three months from now when rotation prices are going to bottom out as more and more Standard players continue to dump cards like gods. 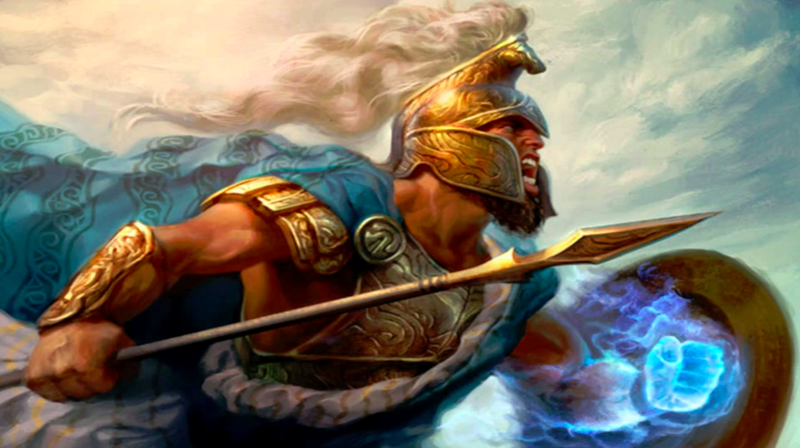 All the gods from JIN are going to be great pickups at this point, as they are the rarest gods by numbers are JIN was the least opened of theTheros sets. A CAVEAT – The enemy colored Commander decks being released this fall could contain one copy of each of these gods. If that is the case, then the JIN gods are going to take a huge hit in value and be suppressed in price for quite some time. Keep this in mind while waiting to pickup gods. Foils are better targets for this reason, at least until we know if they’re in Commander 2015. Dictate of Erebos is the final mention I’d like to make. This card is going to be casual gold and is the bottom dollar slow gainer that will make waves over time. It is already almost up to $2 retail with no Standard play and rotation about to happen. Foils will be especially good targets moving forward. Unfortunately there just isn’t anything appealing to me in BNG for pickups moving forward. Brimaz is a great card, it is very efficient for the mana cost, but right now white weenie strategies in Modern just aren’t that great. He will be an amazing Commander, and will even be great in Legacy Death and Taxes, but for Brimaz to carry the bulk of the set’s value is pretty sad and I don’t think he is going to be going over $10 for the foreseeable future. Even Courser, a Standard powerhouse, is lackluster in eternal formats and is hardly worth picking up right now. Again, Commander applications and sometimes seeing the Courser in Modern/Legacy isn’t going to be enough to make it see significant gains anytime soon. Since we’re not going to be getting enemy colored Commander decks in the near future, I would feel very comfortable going deep on some of the more popular gods from the set about three months from now. Even with Karametra, you can’t go wrong picking up copies at $2 or less since casuals love these types of big, splashy mythics. We’ve already discussed Thoughtseize at length, so let’s take a look at some of the cards in the set with the knowledge that they are going to be the most suppressed since Theros was open the most of the sets in the Theros block. Ashiok is a sweet card, one that has applicability both because of Modern and Battle for Zendikar’s Eldrazi Ingest theme. I don’t think the card is going to get much cheaper than $6-$7 per copy, since UB Mill is a thing with casual kitchen table Magic. Picking up plenty of copies in anticipation of future demand is a fine move. On the other hand, I’m not so keen on Theros Elspeth due to the Duel Deck printing so I would advise to avoid these cards since there are tons more Elspeths than Ashioks out there. Both foil and non-foil versions of Nykthos have started seeing upward movement upon rotation, and for good reason – this card is a Cabal Coffers for any color that is also Modern legal. I mean, the foil has already spiked and it hasn’t even left Standard yet! Pick up your copies now before the next season’s Modern deck is going to make non-foils spike as well. Master of Waves has a great Modern advantage due to being featured in Merfolk, one the top decks of the format. Foils are great targets, but even nonfoils at $4 and less are going to look good a while from now. Monocolored gods, like their BOG and JIN bretheren, are also going to be nice pickups for future gains. Some will gain more than others as we see how they fit into Commander moving forward, but foils of each should be nice collector’s items in the future. If you want foils to finish out Commander decks than rotation is going to be the best time to get deals on these cards. So there you have my thoughts about Theros since rotation is upon us. Is there anything else you guys think I should be mentioning, or that I glossed over that has more applications than I think? What are you guys targeting for rotation, and how deep are you? Personally, I’m looking to start picking up foil Theros Thoughtseize since I think it will be one of the more solid places to park value, but maybe I’m overlooking a cheaper option. As always, let me know in the comments and thanks for reading. Have you ever had Courser in play with a Sylvan Library? I am working on a Naya build with Exploration, Courser, Library, Crucible of Worlds with a package of Root Maze and Choke for the hate. I think it will splash Red for P. Fire and White for Swords, Pridemage, Teeg and Knight. It will be sweet. Maybe not good but certainly sweet. Seems like a cool Legacy deck! A new spin on Zoo, which has fallen out of favor but maybe you’re going to bring it back ;D ? I picked up gods for a while now. Ephara is awesome in UW Flicker, Phenax is a nice build-around card (UB Mill), Heliod makes tokens and Clerics are bound to return as a tribe. The others are fine as well, but those are the ones I horded the most and all can (but shouldn’t neccessarily) be played in Esper EDH. Brimaz isnt a good fit for Legacy death and taxes, good reason it hasnt seen play there. Hmm, that’s true we haven’t seen Brimaz in a Legacy deck since June. Probably due to the printing of Vyrn Wingmare. Well, if Brimaz was already unappealing before this makes it even worse as a pickup. Brimaz has seen play as a 1of or 2of in a lot of D&T lists. Probably less so now with wingmare, but it’s not like he’s never shown up. Three different Legacy Opens have been won with Brimaz in the list. 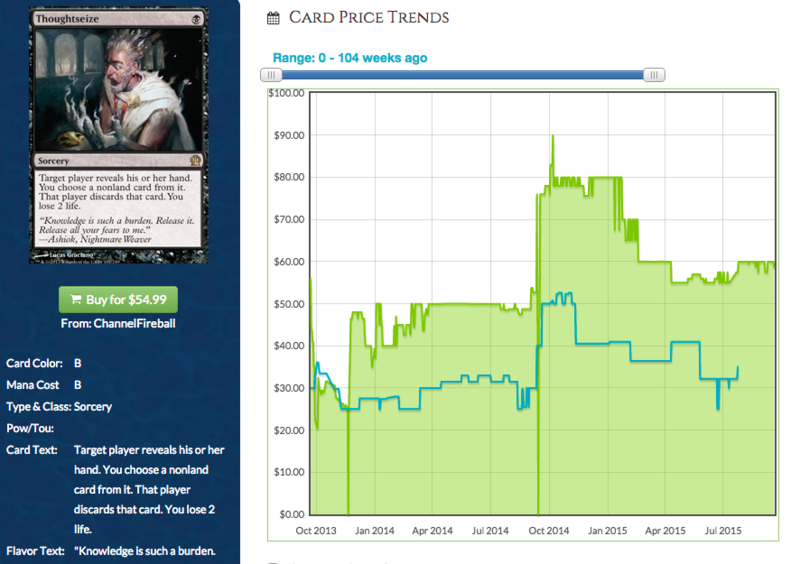 But Brimaz being an occasional 1-2 of in a deck that isn’t played that much in legacy doesn’t support much price growth. What’s your feeling about the scryland ? Any tought on prophetic flamespeaker from JIN ? I find it very low on price for a mythic and actually pretty powerfull. Scry lands at $1 are good, but only a few see play in modern (Temple of Enlightenment & Deceit in Ad Nauseum, and Temple of Malice in Grishoalbrand). Those are the best targets. Still can’t go wrong picking up $1 lands for casual play, though. My friends who are Modern Jund players tell me that Prophetic Flamespeaker just doesn’t get the job done in that deck. It was tried for a while but fell out of favor for that reason. I think Courser has a better chance to make it back into the deck than Flamespeaker does. Agreed, of the two I would definitely target Courser over Flamespeaker. Scrylands will be fine pickups three months from now but don’t go deep on them. Pick up your copies for Commander, especially foil versions if you do decide to get some, but Scrylands shouldn’t be cards that you speculate on. 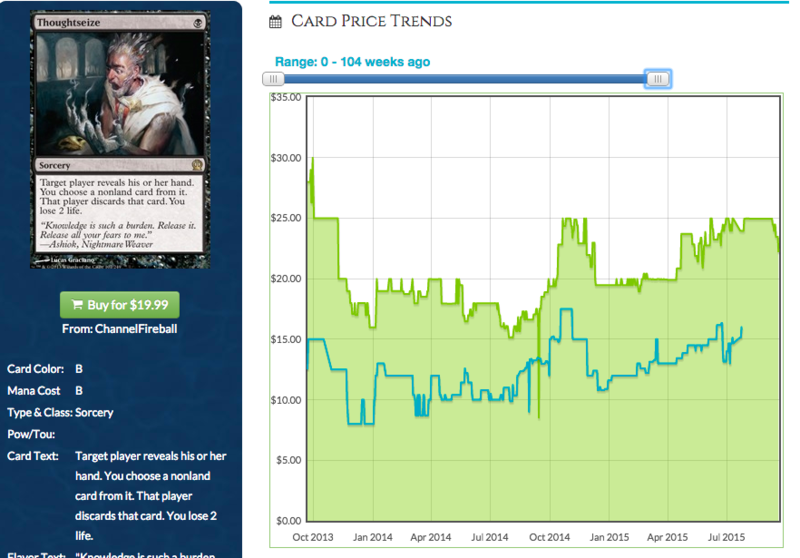 They only see marginal play in Modern, so targeting blue ones seems good but the others will always be pretty cheap. Prophetic Flamespeaker’s best chance to shine was in Standard, and it was unable to do it then. Barring some type of crazy combo / synergy in the future, I would stay away from this guy. It would take a lot for it to rise above bulk mythic status in the future, and there are better targets to pick up in the present. Sorry, I got a bit muddled when I mentioned them a second time in the article. Slip of the brain, I’m afraid. Jared actually mentioned the enemy-colored decks planned for fall in his review of Keranos. I see Prophetic Flamespeaker eventually getting broken and if you get him for bulk mythic price you aren’t really missing out on much or gambling. 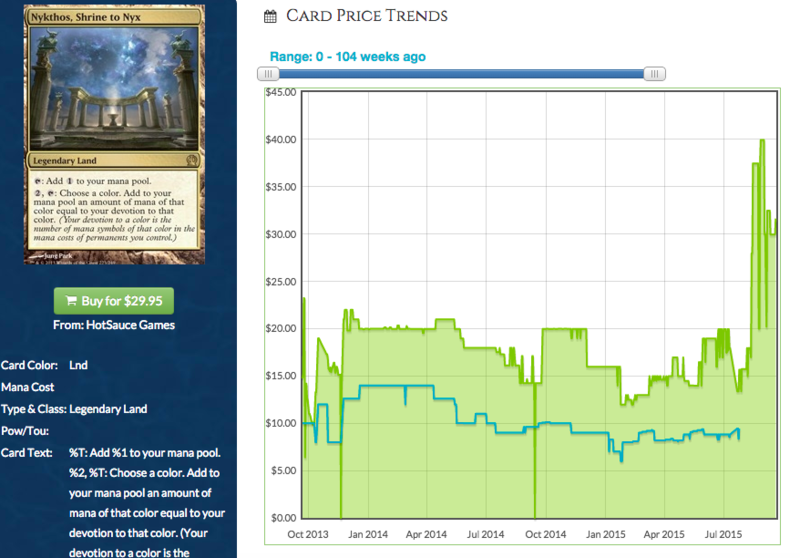 I mean $2-4 for a playset of a mythic in one of the least produced sets in the “modern era” of magic seems fine. It’s also a human, and can legitimately win the game on turn 4 with Become Immense and/or Titan’s strength. Infect is a better creature combo deck, but don’t sleep on the fact that Flamespeaker is a human and provides pseudo card draw. Two cards that I have continually been targeting are foil Swan Song and foil Spirit of the Labyrinth. I used Swan Song to phenomenal effect in Standard while playing Jeskai Ascendency combo. When more combo and Modern players realize that the 2/2 swan token is virtually meaningless when u need a versatile counterspell to win on that turn Foil Swan Song will spike like people have been predicting since it was released. Spirit is a 2 mana 3/1 white creature and is 2 mana less than Notion Thief. The card does too much to hose Brainstorm (and Jace TMS) and Serum Visions to not see even more play going forward. 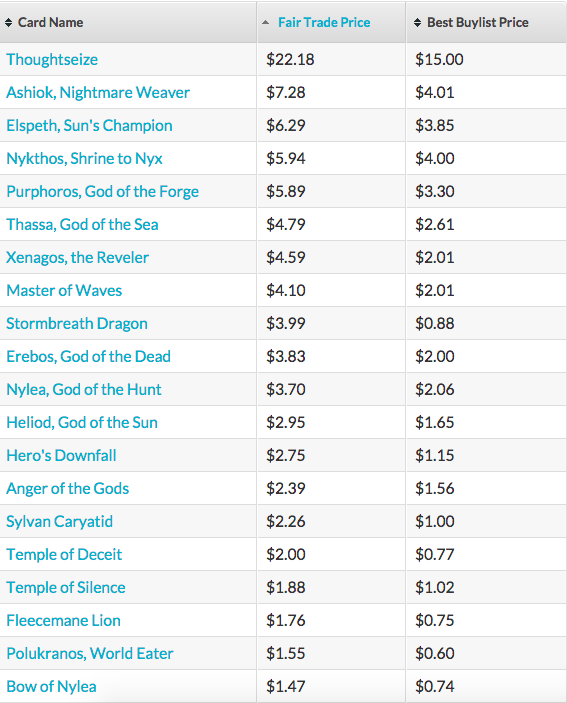 I think the new judge foil Rishadan Ports and decline in price of Wasteland will allow players who hate blue to build Legacy Death and Taxes cheaper and more easily (granted Vial has spiked). Oh, and Foil Mana Confluence can only go up. It didn’t get enough Standard love and Andrew Boswell wrote a “too late to cause a price change” article about playing 4 mana confluence in his Abzan Aggro decks that he eventually won a SCG Open with. Mana Confluence is viable in EVERY format. I will gladly pick up every single foil I can get my hands on for the overpriced BFZ lands I open during prerelease. As always, nice additional thoughts Spencer! I actually have some copies of foil Swan Song myself and can’t believe I missed that one in my article. I also am a strong believer in the long term gains of Swang Song. Not sure about Spirit long term, but I do agree that it is a strong hoser for card draw strategies. I do like foil copies of Mana Confluence too.